The word “cult” derives from the Latin cultus, meaning "care" or "adoration." 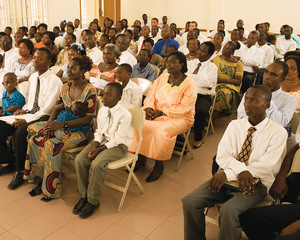 By this definition, almost all religions, including The Church of Jesus Christ of Latter-day Saints, exhibit at least some characteristics of a cult. a) A system or community of religious worship and ritual. b) The formal means of expressing religious reverence; religious ceremony and ritual. This third definition clarifies the meaning most laypeople intend when they define a religion as a cult. Unfortunately, this definition reflects not any recognized religious category, but rather their own personal or religious biases. Based on this definition all religions qualify as cults, since each is considered false by some other group. Mormons don’t believe that their religion should be classified as a cult. In fact, very few people define their own church or religion as a cult, but usually they use this term to criticize or downplay the value of another religious faith. In practice, it is usually the religious minorities that are defined as “cults” by the traditional religious leaders of the time. For example, the negative label “cult” has been given to recently formed groups as the Unification Church or the Hare Krishna movement. However, even early Christianity or Islam during the life of Muhammad were considered “cults”. A more scientific definition of “cult” refers to the beginning phase of a new religion. If we follow this approach, a cult’s main characteristic is that it provides a radical break from existing religious traditions. If we use this definition, we can say that initially Mormonism was a cult, because it challenged and broke away from the existing religious traditions. However, most religious groups that start as cults fail to survive more than a single generation, and very few evolve into developed, mainstream religions; this was not the case with Mormonism. In fact, social scientists and religious historians now generally agree that Mormonism as represented by The Church of Jesus Christ of Latter-day Saints should be classified not as a cult, but rather as an example of a successful transition to the status of new religious tradition. This page was last edited on 15 September 2010, at 08:34.